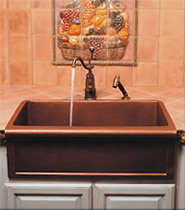 A copper sink is an artisan piece much like a painting or a sculpture. The process of hammering and shaping the sink gives it an individuality, a personality that's all its own. Each sink bears the mark of its maker by the process in which it is shaped and hammered, like the signature of the artist on a painting. A copper sink is a beautiful and classic way to update your kitchen. Not only is it lovely, but it's a low maintenance fixture and naturally resistant to stains, discoloration and bacteria. Each sink is unique, though they may appear similar. When shopping for a copper kitchen sink, you may be tantalized by a lower price, but it's important to check the gauge of the sink. The gauge of the sink means the thickness of the metal. You want a smaller number gauge because the smaller the number, the thicker the sink. Copper sinks range from 18 gauge to 14 gauge. There is some extra cost involved, but thinner sinks are prone to denting and damage. They also have an unpleasant tinny sound, though if a thinner sink is chosen, they can be fitted with hardware so that the sound isn't a problem. It's best to find a gauge that's somewhere in the middle range, a good solid piece that won't destroy your budget. 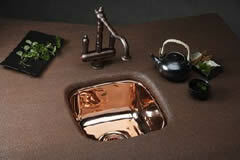 It's possible to find a quality copper sink for only a few hundred dollars. On the higher end, it ranges into the thousands. 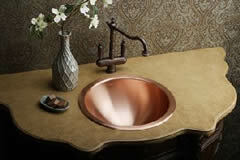 One of the main selling points for copper sinks is the finish. Copper sinks have what's called a living finish. What this means is that the appearance and texture of the sink will change over the life of the sink. The process of a finish's change is called patination and in turn, the resulting finish is called a patina. 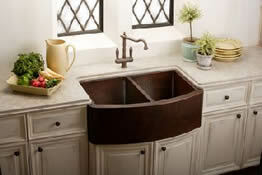 While other metals, such as bronze will sometimes have a green patina, your copper sink should not. 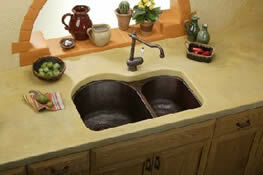 The patination on your sink will add beauty as it ages. Some companies that produce these sinks will speed the patination along with various treatments to allow for specific styles. Be sure that you do your research and inquire which treatments that your sink has received and find out what your sink will look like in five years, ten years, even twenty years. If the look of aged copper doesn't appeal to you, it's possible to keep it looking bright and new with sanding and polishing, but it is a continuing process. It's possible to apply a specialized wax that will help maintain the look you're going for. Otherwise, maintenance and cleaning for your copper sink is rather simple. All you need is soap and water. Unless you let your pots and pans sit in the sink for an extended period of time and then rigorous cleaning is needed. Abrasive materials and cleaners can damage your copper sink, though application of the above-mentioned wax not only slows patination, but it can help protect your copper kitchen sink as well. Choose from these Beautiful Sinks or Shop the Entire Collection of Copper Sinks Today!